The Z1 Dashboard software currently supports 15 racing simulations. 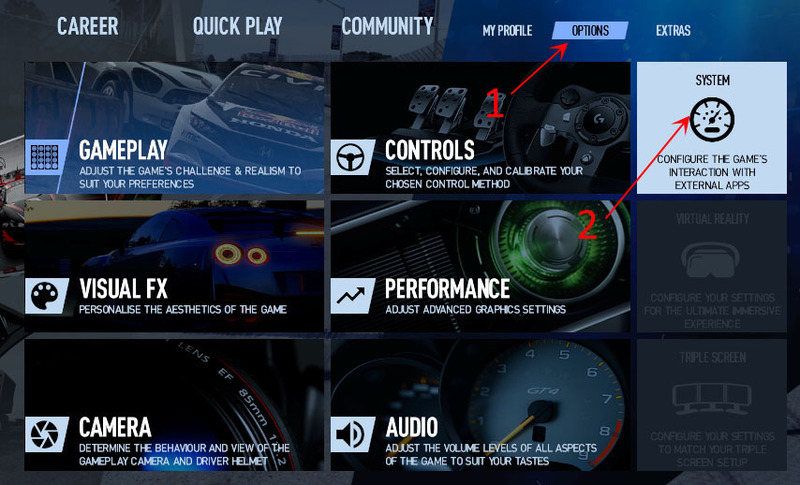 This page describes how the Z1 Dashboard software connects to each of those racing simulators. Note that sometimes certain anti virus software can interfere with the connection between the Z1 Dashboard and your sim by either placing the Z1 Dashboard software in a 'sandbox' where it can't communicate with any other processes, or by preventing certain ports from being opened. If you find that you are unable to connect to your racing simulator, then the first place to look is your anti-virus software. iRacing is extremely simple to setup. There is actually nothing you have to do. Just launch the Z1 Dashboard software and then launch iRacing. The software will detect that iRacing is running and then display the statistics screen or your favorite sim racing dashboard. To get all the information from Assetto Corsa you will need to install the python plugin. The plugin is located in documents/z1dashboard/plugins/assettocorsa. There you will find a folder called Z1Dashboard. It contains the plugin 'Z1Dashboard.py'. Copy the entire folder into Program Files (x86)\Steam\steamapps\common\assettocorsa\apps\python. (You should end up with the Z1Dashboard folder inside the python folder as shown below. And that Z1Dashboard folder should contains a file called 'Z1Dashboard.py' and two other folders called 'lib32' and 'lib64'. Then when you start Assetto Corsa look in the General settings under the UI Modules and make sure the Z1Dashboard module is selected, as shown below. Note that the Z1 Dashboard software recognizes Assetto Corsa when you actually go to the track, and not when you are still selecting the car and track. The connection to Automobilista requires that you place the Z1Automobilista.dll plugin into the Automobilista plugin folder. The Z1Automobilista.dll plugin file is located in documents/z1dashboard/plugins/automobilista. You will need to copy this into the plugins folder of your Automobilista installation. Once there simply start your Z1 Dashboard software and then start Automobilista. The connection to rFactor 1 requires that you place the Z1SWRF.dll plugin into the rFactor 1 plugin folder. The Z1SWRF.dll plugin file is located in documents/z1dashboard/plugins/rfactor1. You will need to copy this into the plugins folder of your rFactor 1 installation. Once there simply start your Z1 Dashboard software and then start rFactor 1. The connection to rFactor 2 requires that you place the Z1SWRF2.dll or the Z1SWRF264.dll plugin into the appropriate rFactor 2 plugin folder. Both files are located in the documents/z1dashboard/plugins/rfactor2 folder. The Z1SWRF2.dll is for 32 bit versions of rFactor 2. The Z1SWRF264.dll is for 64 bit versions of rFactor 2. The rFactor 2 32 bit plugin folder is located at \Program Files (x86)\rFactor2\Bin32\Plugins. The rFactor 2 64 bit plugin folder is located at \Program Files (x86)\rFactor2\Bin64\Plugins. You will need to copy the appropriate plugin into the plugins folder of your rFactor 2 installation. Once there simply start your Z1 Dashboard software and then start rFactor 2. Note that there will be about a 10-20 second delay when you get in the car before rFactor 2 will start broadcasting data. This results in the software not detecting that you are in the car for those 10-20 seconds. You will notice a small 'plug' icon at the top left of your rFactor window which will shrink away when rFactor 2 starts to broadcast the data. RaceRoom is extremely simple to setup. There is actually nothing you have to do. Just launch the Z1 Dashboard software and then launch RaceRoom. The software will detect that RaceRoom is running and then display the statistics screen or your favorite sim racing dashboard. The connection to ARCA Sim Racing requires that you place the Z1SWArca.dll plugin into the ARCA Sim Racing plugin folder. The Z1SWArca.dll plugin file is located in documents/z1dashboard/plugins/ARCA Sim Racing. You will need to copy this into the plugins folder of your ARCA Sim Racing installation. Once there simply start your Z1 Dashboard software and then start ARCA Sim Racing. The connection to Game Stock Car requires that you place the Z1SWGSC.dll plugin into the Game Stock Car plugin folder. The Z1SWGSC.dll plugin file is located in documents/z1dashboard/plugins/Game Stock Car. You will need to copy this into the plugins folder of your Game Stock Car installation. Once there simply start your Z1 Dashboard software and then start Game Stock Car. The connection to Kart Racing Pro requires that you place the Z1SWKRP14.dlo file into the Kart Racing Pro plugin folder. The Z1SWKRP14.dlo file is located in documents/z1dashboard/plugins/Kart Racing Pro. You will need to copy this file into your Kart Racing Pro plugins folder. Once done simply start your Z1 Dashboard software and then start Kart Racing Pro. There is nothing you need to do to connect to your favorite SimBin sim. Just start the sim and start the Z1 Dashboard software. When you get in the car the Z1 Dashboard will recognize the sim and display the dashboard. Note that as SimBin does not output the type of car being driven that the Z1 Dashboard has to do some guesswork to determine which car is being used. You can still customize the dashboard for the car, but note that not every car may be uniquely identified, resulting in the same dashboard being used for multiple cars. Also note that as SimBin does not output when the sim has exited, the Z1 Dashboard assumes that if the sim does not output any new data within 10 seconds that it has exited. This means that if you are in the process of selecting an event that the Z1 Dashboard might un-connect from the sim and then instantly reconnect. This is normal behavior. Project CARS requires that you turn on the Use Shared Memory option in order for the Z1 Dashboard software to successfully communicate with Project CARS. 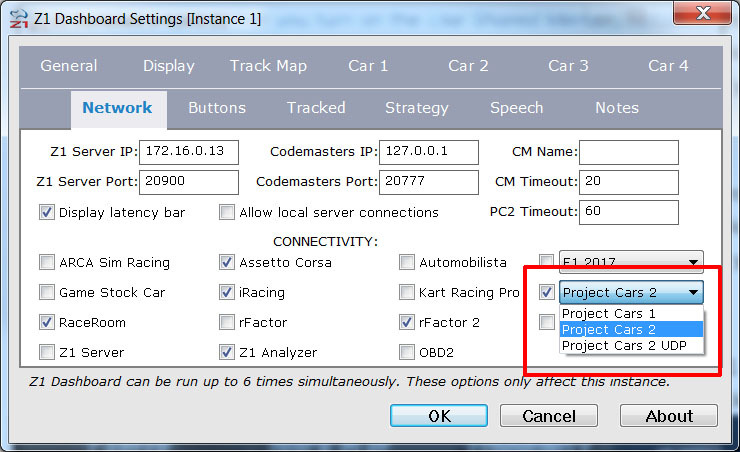 This option is located within Project CARS under Help & Options. Choose Visuals and the Use Shared Memory option is located in the Hardware menu block. Make sure this is set to Yes. 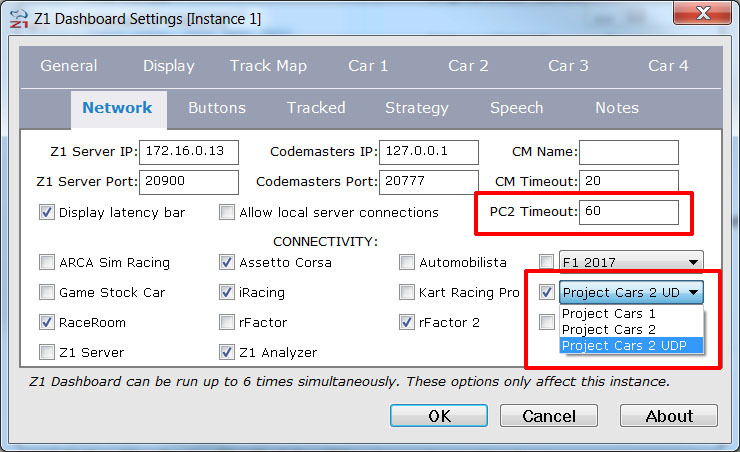 Once done simply start your Z1 Dashboard software and it will recognize Project CARS. Project CARS 2 requires that you turn on the Shared Memory option in order for the Z1 Dashboard software to successfully communicate with Project CARS 2 using Shared Memory. This option is located within Project CARS 2 under Options. Click on the System block to get to the Shared Memory options. Then on the next screen you will see options for Shared Memory, UDP Frequency and UDP Protocol Version. You can set UDP Frequency to Off, unless it is needed by another application. Set Shared Memory to 'Project Cars 2'. Then go in the Z1 Settings Dialog, click on the Network tab and look under Connectivity. Make sure the checkbox next to the Project Cars drop down is ticked. And choose 'Project Cars 2' from the drop down. Project CARS 2 requires that you turn on the UDP stream in order for the Z1 Dashboard software to successfully communicate with Project CARS 2 using UDP. This option is located within Project CARS 2 under Options. Click on the System block to get to the UDP options. Then on the next screen you will see options for Shared Memory, UDP Frequency and UDP Protocol Version. You can set Shared Memory to No, unless it is needed by another application. Set UDP Frequency to the lowest number your system will support. 1 outputs the data at the fastest rate, giving you better resolution especially when recording telemetry for the Analyzer. Some system may not be able to stream the data fast enough to support the lower numbers, so if you find the Z1 is running behind the sim, try a higher number. Set UDP Protocol Version to 'Project Cars 2'. Then go in the Z1 Settings Dialog, click on the Network tab and look under Connectivity. Make sure the checkbox next to the Project Cars drop down is ticked. And choose 'Project Cars 2 UDP' from the drop down. Note that due to how Project Cars 2 sends the UDP data it does not always send the signal that the sim has exited when you exit the sim. However it does cease sending telemetry data when it exits. Unfortunately it also ceases sending telemetry data if it is paused. The sim will pause whenever the sim looses focus. This can happen if you open the Z1 Dashboard settings dialog. Because we don't want the Z1 to disconnect whenever we open the settings dialog the Z1 will wait one minute (60 seconds) after the telemetry ceases before assuming the sim has exited. You can adjust this setting by changing the value in the PC2 Timeout text field. Note that we also highly recommend that you have the Z1 Dashboard running before you start up the sim. Project Cars 2 sends out UDP data in a very specific order. If you start the Z1 Dashboard after the sim has started it may miss important data, such as the car or track being used, or competitor data. F1 2018 requires that you turn on the UDP stream in order for the Z1 Dashboard software to successfully communicate with F1 2018 using UDP. This option is located within F1 2018 under Game Options. Click on the Settings option to get to the settings screen. Once in the settings screen, scroll down to the Telemetry Settings line and select it. Then on the next screen you will see the various UDP options. Set the UDP Telemetry option to On. If you are using other applications that require UDP access then you'll need to set UDP Broadcast Mode to On. Otherwise set it to Off. The UDP Send Rate should be as high as your system can handle. You may need to experiment with this value to get the option that best suits your system. The UDP Format should be set to 2018. The first three lines, D-Box, Fanatec LED and SLI Pro LED should be set to Off unless you need them to work with their respective hardware. Then go in the Z1 Settings Dialog, click on the Network tab and look under Connectivity. Make sure the checkbox next to the Codemasters F1 drop down is ticked. Then choose 'F1 2018' from the drop down. 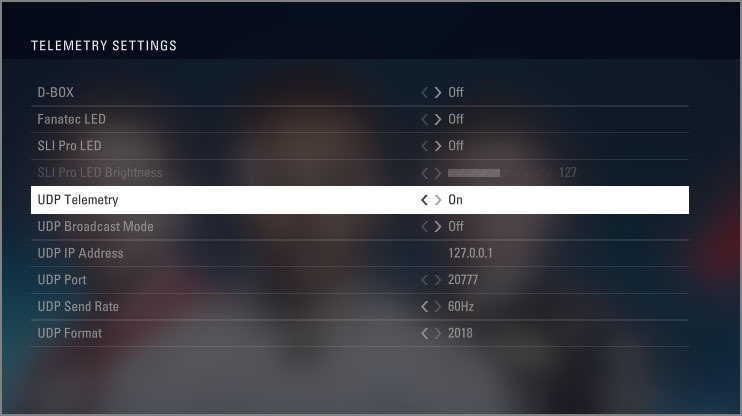 Note if you selected broadcast mode in the sim's settings then you should choose 'F1 2018 BC'. Note that due to how F1 2018 sends the UDP data it does not always send the signal that the sim has exited when you exit the sim. However it does cease sending telemetry data when it exits. Unfortunately it also ceases sending telemetry data if it is paused. The sim will pause whenever the sim looses focus. This can happen if you open the Z1 Dashboard settings dialog. Because we don't want the Z1 to disconnect whenever we open the settings dialog the Z1 will wait one minute (60 seconds) after the telemetry ceases before assuming the sim has exited. You can adjust this setting by changing the value in the CM Timeout text field. Note that we also highly recommend that you have the Z1 Dashboard running before you start up the sim. F1 2018 sends out UDP data in a very specific order. If you start the Z1 Dashboard after the sim has started it may miss important data, such as the car or track being used, or competitor data. 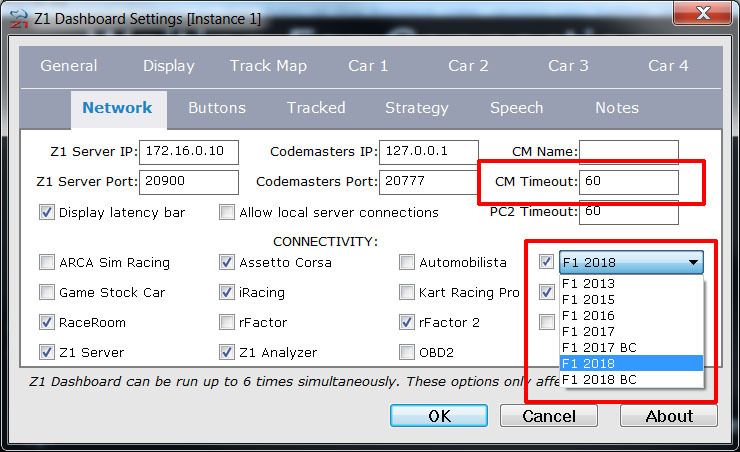 Codemasters uses a UDP connection to communicate with the Z1 Dashboard software. First make sure that the Z1 software is set to scan for the F1 2017 sim. This is done ind the Network tab of the Z1's settings dialog. Second, you will need to tell the sim to send the UDP data. To do so go to the preferences menu tab and select UDP Telemetry Settings as shown below. Then make sure the UDP Telemetry option is set to On. Set the Send Rate as high as possible. 60 Hz is currently the highest setting. If you are having difficulties in connecting, then ensure that your anti virus software or firewall is not blocking the IP Address or Port. By default these are IP Address 127.0.0.1 and Port 20777. You can change these if necessary in the Network tab of the Z1 Dashboard's settings dialog. Codemasters uses a UDP connection to communicate with the Z1 Dashboard software. First make sure that the Z1 software is set to scan for the F1 2016 sim. This is done ind the Network tab of the Z1's settings dialog. Second, you will need to update your hardware_settings_config.xml file for the sim in order to turn on the data feed. This file is located in Documents\My Games\FormulaOne2016\hardwaresettings. Note that sometimes with Codemasters sims, there can be a delay of data through the UDP connection making the Z1 Dashboard lag behind by about a second or two. If you find this happening please make sure you do not have any firewall, anti-virus software, or other devices that might be filtering or slowing the data. Codemasters uses a UDP connection to communicate with the Z1 Dashboard software. First make sure that the Z1 software is set to scan for the F1 2015 sim. This is done ind the Network tab of the Z1's settings dialog. Second, you will need to update your hardware_settings_config.xml file for the sim in order to turn on the data feed. This file is located in Documents\My Games\FormulaOne2015\hardwaresettings. Codemasters uses a UDP connection to communicate with the Z1 Dashboard software. First make sure that the Z1 software is set to scan for the F1 2013 sim. This is done ind the Network tab of the Z1's settings dialog. Second, you will need to update your hardware_settings_config.xml file for the sim in order to turn on the data feed. This file is located in Documents\My Games\FormulaOne2013\hardwaresettings.